I’ve been thinking a lot about the CD player that Mary bought me for Christmas 1986 and how it was the start of the musical connection that Scott and I have. I was going to give him credit for the fact that Springsteen’s “Live 1975-1985” showed up under the tree, but apparently he was just along for the ride. His reference to “the amazingly cool upright silver record player in the corner Dad so cherished” certainly brings back fond memories. Now that we can all carry the contents of a large record store around in our pockets, it’s sometimes hard to remember the energy (and money) that went into feeding a music obsession in the pre-digital era. While it paled in comparison to the really nice component stereos some of my more affluent friends had, it served me well through college and beyond. When the motor on the turntable died my new wife (who also recognized the obsession, though not understanding how deeply it ran) grudgingly agreed to shop for a new unit. Yet another Zenith. I wasn’t particularly brand loyal but our sister-in-law worked at a furniture store that handled Zenith and got us a deal. 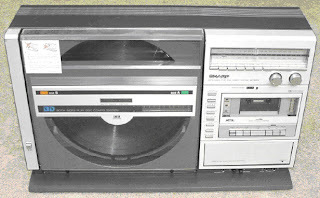 It had a single play turntable (I guess I’d learned my lesson) and an AM-FM quadraphonic receiver. We spent extra for the second set of speakers but like a fool I didn’t pony up for the unit with the cassette player. The speakers turned out to be a great investment because they still sound great thirty-six years down the road. Which brings us to the cherished silver record player. Zenith #3 carried me through at least ten years but its’ turntable died as well. I had a good job and some money in the bank and decided it was time for some cutting edge technology. 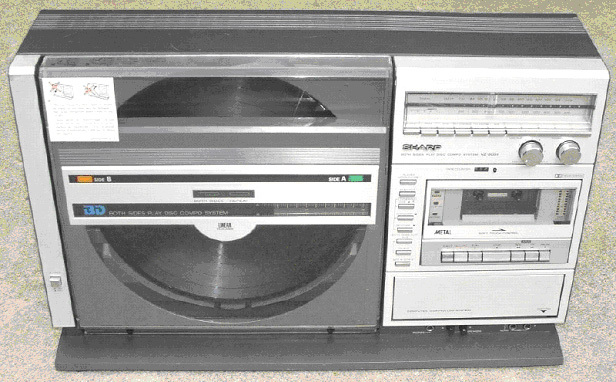 Sharp had just come out with a modular unit that had an AM-FM tuner, a cassette player and a vertical two sided turntable. Most important, although I didn’t realize it at the time, was the fact it had several inputs for external music sources. They came in very handy when that CD player arrived. We've been cleaning out my grandmother's house recently and I came across her large collection of vinyl. Most, it was a lot of big band stuff that I'm not that interested in, but I found some other fine nuggets of classical music, Opera, Elvis, Jazz and other random stuff that looked interesting. So, I went ahead and got a vinyl player from target. Nothing too fancy, no audiophile stuff [I've got a car and computer system for that]...but, something I could listen to it on. After that, I spent a couple very fun and rewarding weekends going through the used bins at Wuxtry, Book Nook, Criminal & Decatur CD. At the end of it all, I found myself with some old Gary Numan, Pink Floyd, Kraftwerk, Peter Gabriel, The Cars and more. Mostly bought for $3-5 dollars a piece. Now, with this nice looking 'antique' looking Croseley record player, I've been spending a lot of time in my living room listening to all of it and it's been some of the greatest and most fun listening I've had in a LONG time. It sounds like crap, really...but, it's almost like listening to a remix and it's relaxing to my ears. I think we forget how trained our ears get to the new production styles. Plus the tactile feel of handling the jackets and the vinyl reminds me just how much value music has...and I like introducing my kids to this, as I want to make sure they understand the concepts as well. Music does not have to be disposable. Music is valuable. So, to me, it's ALL WIN. It's inexpensive, a lot of fun and I get to support some local shops. Anyhow, I just wanted to say CHEERS to you guys for your new blog and share a little.